Not many of us can look at a genetic code and be inspired to create artwork from it. For most people a DNA sequence looks like a jumble of letters, wavelengths and bright colors. Max Nanis, however, is not “most people.” Max has married his artistic and scientific backgrounds into a project that he is calling the “Sanger Series.” His series focuses on using a hand-crafted algorithm to digitally display gene sequences in a 2-dimensional format. During his undergraduate studies Max focused on Computational Biology and Sculpture which helps to explain the unique approach and subject matter of his artwork. With a primary interest in structural biology, and a lifetime recollection of continuously building and creating, anyone could see this project evolving in Max’s mind from a mile away. One of the first genes that Max transformed into a 2-D model was the BRCA2 gene. 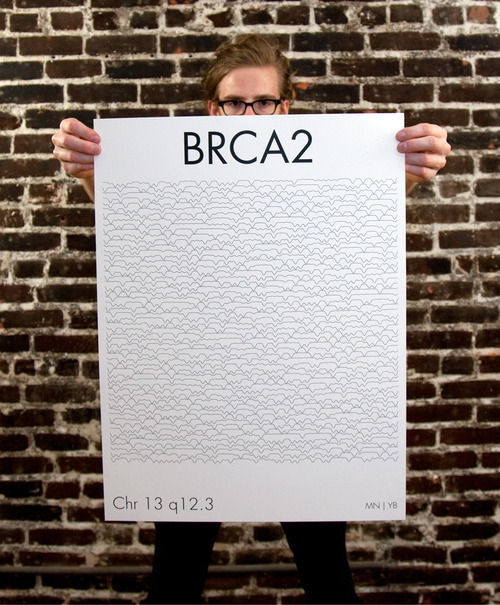 BRCA2 is a tumor suppressor gene located on chromosome 13. When mutated the BRCA2 (BR for breast, CA for cancer) gene is one of the genes responsible for hereditary breast and ovarian cancer. NATALIE (MYRIAD GENETIC LABORATORIES): What made you choose the BRCA2 gene as the first in your series? MAX NANIS: BRCA2 wasn’t actually the first gene I’ve worked with in the series. I originally played with a range of Hox genes (HOXD11 in particular). Those previous works were primarily individual pieces that I spent a great deal of time working with, investigating and manually iterating through their potential form variations. Hox genes are great because they’re so intriguing to non-scientists. I learned a great deal exploring the placement and disruption of forms using a programmed machining technique to alter the order and placement of the Hox representation just as a mutation would. My interest for BRCA2 emerged out of Association for Molecular Pathology v. Myriad Genetics, Inc.
N: Were you always this interested in science or is this gene artwork your first step into the hybrid world of science and art? MN: The scientific method has always been an integral part of my life. I’m currently at The Scripps Research Institute with the Su Lab investigating crowd based collection of genomic information (as well as many other things). In addition, I’ve been highly involved in the 3-dimensional representation of proteins at the Molecular Graphics Lab and the PDB. Each scientific field opens a floodgate of potential concepts, knowledge sources, and readily available data repositories for visualization. To me, science is the art of inquiry and this hybrid world on the elegant appreciation for knowledge acquisition and proper representation of it is a beautiful landscape to be positioned in. N: What other projects have you done in the past that have influenced your decisions on the type of medium and style to use for your works? MN: I’ve really enjoyed working with ubiquitin, proteasomes, and ice structuring proteins. Aside from biological influences, I do all of my work digitally. This procedural, iterative, self-documenting and mechanical nature is really intriguing to me which comes out in a lot of my ideas. Creating a narrative through a foreign language and unfamiliar programming technique is a very challenging problem. Mediums that complement or contradict the biological processes I’m thinking of are always the most captivating. N: How did you first learn about Fredrick Sanger and what about him struck a chord with you? MN: Frederick Sanger is a household name to anyone involved with chemistry or nucleic acid sequencing. The fluorescent emission from Sanger sequencing is what really inspired the series. It’s truly beautiful. N: What is the overall message you wish to give to people through the Sanger Series? MN: The message is for the viewer to conceive. I like to provide ideas of mutational defects or great variances in expression levels to provide a relationship to the phenotypic expression of the gene. Viewers are being presented with a visually quantifiable surface where the patterns and forms of the drawings attempt to share the sequential information stored. I’d like to force a viewer to question the purpose of the lines as an attempt to understand the importance of a single base. People have a very difficult time accepting the fragility of their own existence. N: How long did it take you to develop the algorithm for this series? N: Who/what is the biggest inspiration for your artwork? N: Since this is a series can you say what the other genes are in the pipeline and are you planning to focus solely on hereditary cancer-related genes? MN: I’m always looking for new genes to explore. I’ve recently been interested in SRY. It’s really hard because genes are always directly associated with what they encode. This isn’t necessarily “bad,” I just don’t want to visually mirror a gene — that’s boring. I like to explore genes that are easy to overlook as they can tell the most interesting stories. N: Are there any gallery shows in the works? Where can people see your art in person? MN: I’m currently working on a piece for the Smithsonian that will be at the Natural History Museum for their upcoming genome exhibit in June which has been occupying most of my time. There are other projects in the works for after that but nothing to disclose details on at the moment. All of my current work is at my private studio in downtown San Diego. However, people can currently see the Sanger Series at Yonder biology located in Carlsbad, CA — they’re an awesome company that I work with that have a great space for people to check out and enjoy everything out on display. They also have prints available to order online.